This painting was conceived while the artist was living in Peking (now known as Beijing) in 1935-36. Fairweather had first visited China in 1929, where he was captivated by the excitement, colour and cosmopolitanism of Shanghai. He learned Mandarin and travelled with his sketchbook to Beijing, the Lake Country, and the charming towns of Hangzhou and Suzhou. But it was Beijing which captured his interest most, and he determined to return there after a few months in Melbourne in 1934. 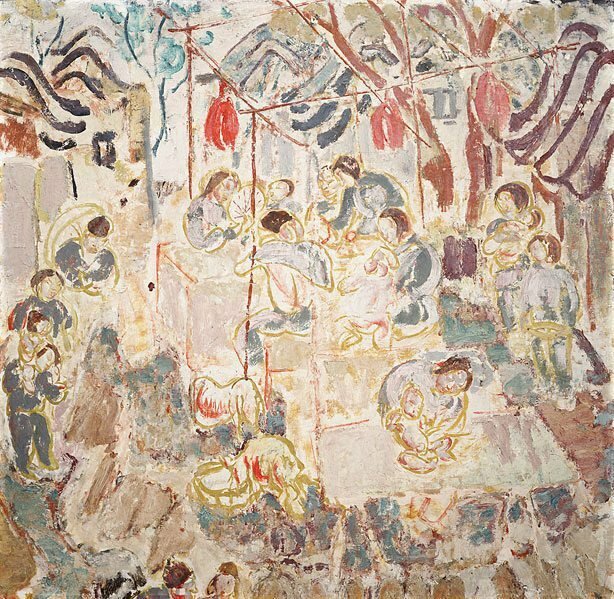 'Tea garden, Peking' reveals Fairweather's Slade School training in figurative drawing and his awareness of both western modernism, and oriental painting and calligraphy. He made a number of related studies, including a smaller version, now in the Ulster Museum, Belfast. The painting's complex but harmonious composition, and its joyous celebration of colour and the tactile qualities of paint is central to the attraction of Fairweather's work to so many younger Australian painters. The central motif of mother and child is repeated in many other paintings and drawings, including 'Nutmeg sifters' and 'Anak Bayan', also in the Gallery's collection. In 'Tea garden, Peking' the figure of mother and child is situated within a clear space at the heart of a microcosm of social harmony - a reflection on a cherished ideal of the artist.